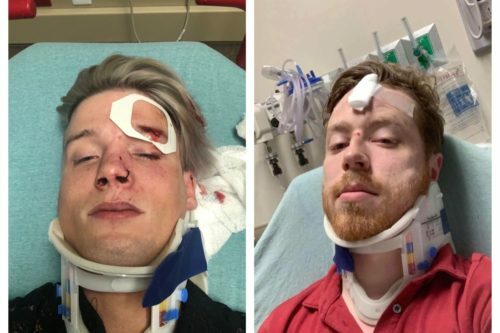 A gay couple that was attacked for holding hands said that they feel lucky to be alive. Spencer Deehring and Tristan Perry said that they had gone to a few bars in downtown Austin, including a gay bar called Rain, late Friday night and were walking together before they planned to drive home. That’s when the man called over four others. “They started following behind us pretty closely yelling every expletive you can think of,” Deehring said. One of the men then punched Perry in the face. He fell down, and two other men hit him. Yet another man kicked Perry in the back of the head, according to Deehring. He said that Perry was knocked unconscious. “The last blow he took was an extremely long kick to the back of his head, so, at that point, I thought he was dead,” Deehring said. He said that he tried to tackle one of the men and the men started punching him until he was knocked unconscious. A bystander called 911 and the attackers fled. Perry’s nose was broken in the attack, lacerations on his lip and head, chipped teeth, and a swollen face. He said that he has back and neck pain now and suffers from memory lapses. In fact, he told KXAN that he doesn’t remember the attack at all due to brain trauma. Deehring has a swollen mouth and jaw, bruising on his head and neck, and he received lacerations to the head that required skin glue. Perry was scheduled to take a state licensing exam this week, but he fears that he will have to postpone it due to the attack. And that’s not the only financial problem they say the attack caused. They started a GoFundMe page to raise money for medical expenses incurred by being taken to the emergency room in an ambulance. They have already raised much more than their original goal of $4000. The couple recently moved to Austin from Corpus Christi, saying that they were looking for a more accepting environment. Austin ranks #2 in anti-LGBTQ hate crimes in Texas, after Dallas, in 2017. “I think that we would both like it to be [investigated] as a hate crime, as well as bringing awareness back to this issue, that it’s still happening in 2019, and, even as far as we’ve come in the past couple of years, that this is still a relevant problem, obviously,” Tristan said. But they said that they don’t plan to stop holding hands in public.